The Ajman International Fair for Education and Training "Aetex 2016" has been successfully concluded on March 10, 2016. In this three-day event over 45 institutions participated. Al Falah University has been a prominent participant among various universities In addition to the promotional participation, a distinguished member of the College of Mass Communication in Al Falah University, Prof. Nasar Abbas also gave a lecture in a conference that was part of this event. The area of discussion was “Knowledge about Sustainable Development”. from the UAE, Jordan, Oman, the US, New Zealand and Britain. All the universities benefitted from the platform provided to promote their offerings. Al Falah University received a large number of visitors who were keen on gaining information about the programs it offers and become a part of the university. 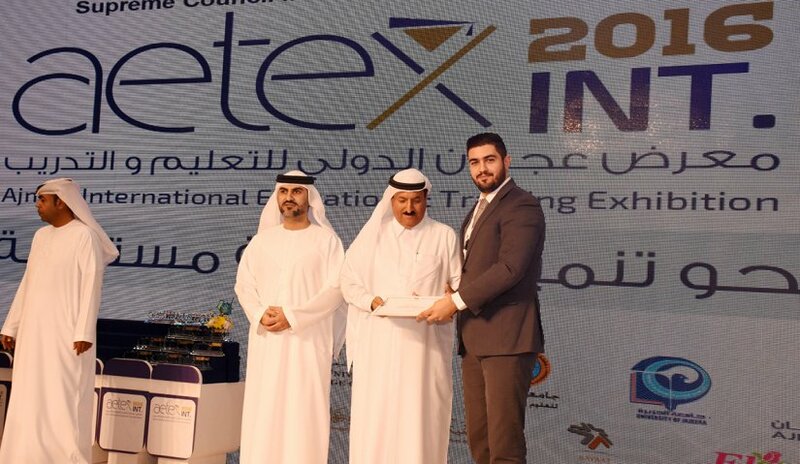 The organizers of the exhibition represented by Mr. Emiri Diwan, Ajman Director and Vice Chairman of the Ajman Chamber of Commerce and Industry, Mr. Hamad Rashid Al Nuaimi, Executive Director and the member of the Ajman Chamber of Commerce and Mr. Nasser Al Zafari, Chairman of the Organizing Committee, honored the participants. They honored Al Falah University with a certificate of appreciation and presented an honorary shield for their active participation. Mr. Nabil Abu Ela, Manager of Student Recruitment Unit received the award and certificate of appreciation. Prof. Nasr Abbas was also awarded for his participation during the exhibition.